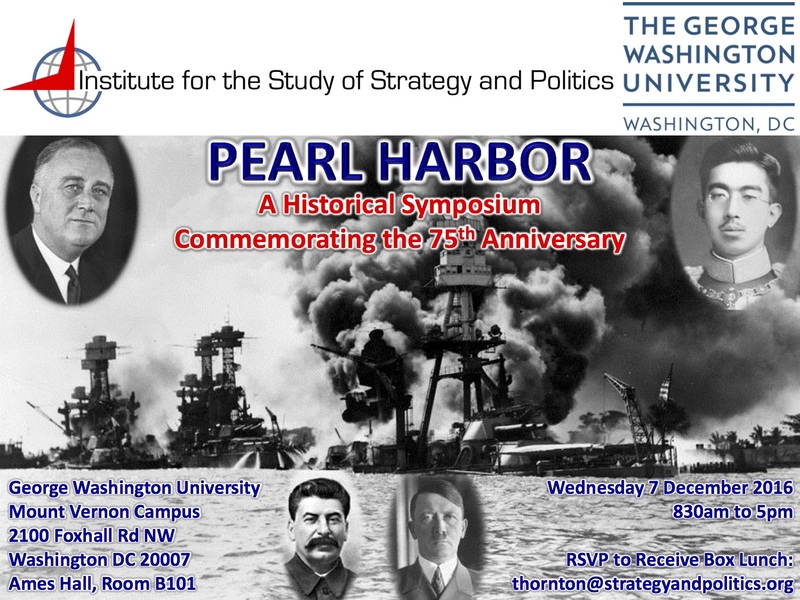 The Institute will hold a daylong symposium to offer a fresh look at the geopolitics, strategy, and tactics that impelled Japan’s attack on Pearl Harbor and its outcome. For the full agenda and speaker bios, click on the Events tab at the top of this page. The Second Issue of the Journal is now available! These are the slides from the opening presentation on President Roosevelt’s strategy. Additional material from the symposium will be published as an issue of our online journal. The first issue of the Journal of Strategy and Politics is online today. To view, click on the Journal tab at the top of this page. The Institute for the Study of Strategy and Politics has just been approved as a non-profit corporation! Our purpose is to advance the understanding of history, military strategy, and national security policy. Our intent is publish historical, national security and strategic research and analysis that will educate the public, inform the policy debate, and stimulate discussion among historians and the policy community. We intend to produce a quarterly journal, for which we will solicit articles. We will distribute this journal electronically and publish it here on this site. We will host an annual conference on a particular theme of historical or strategic interest, to which we will issue a “call for papers” and invite interested professionals and the general public to attend. The proceedings of the conference will be published.